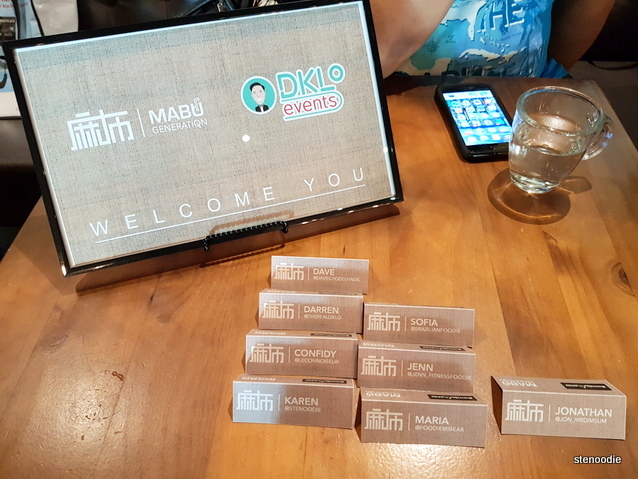 This past Tuesday, I was invited to Mabu Generation to a tasting event organized by DKLoEvents. 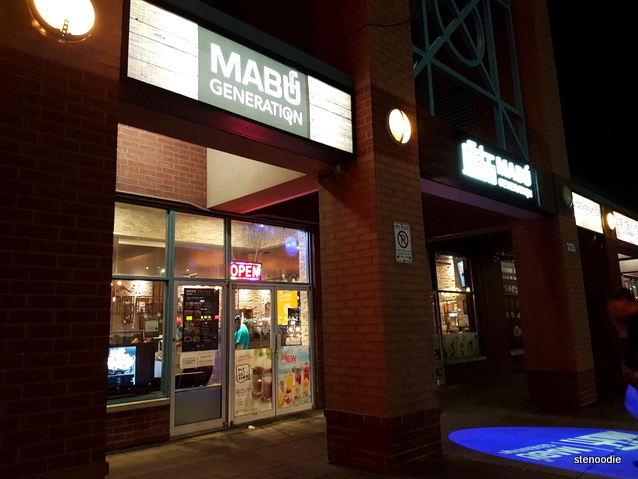 I had been to Mabu Generation for dinner with my friend previously (that blog post is available here). 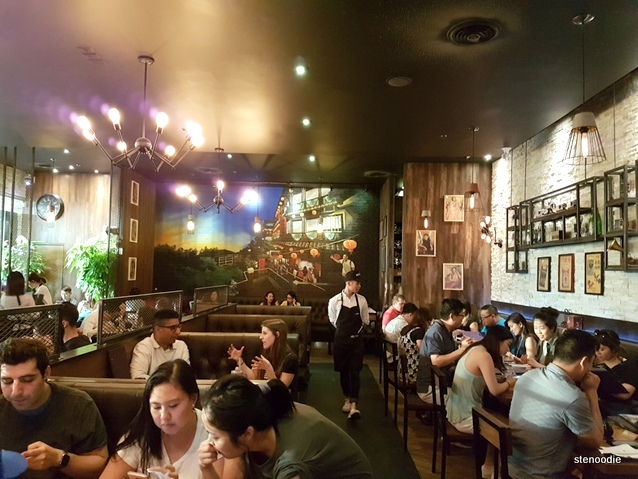 From that visit, I didn’t have the fondest impression of the restaurant because I thought that while their menu selection was large and varied, the quality of the food was a little lacking. 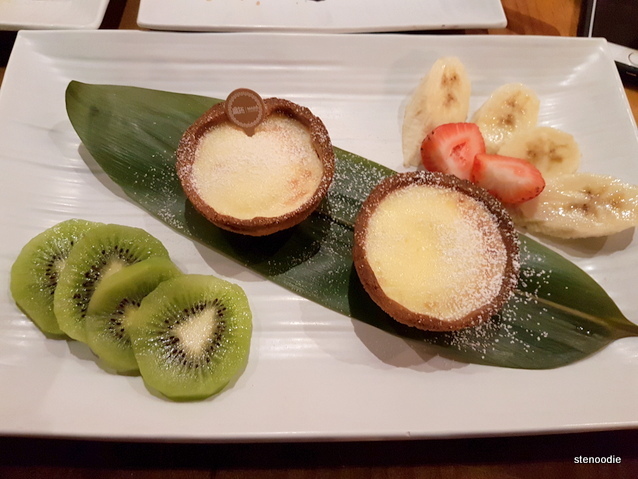 I did say that I wanted to return though because I wanted to try their dessert items and other dishes too — their menu was so large that there was no way to try the majority of everything in one sitting (unless you arrive with a really large group and share everything). The event was slated to begin at 7:30 p.m. 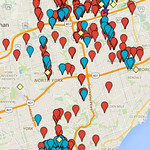 I arrived there right on the dot and waved hello to the food instagrammers that I knew from previous events as well as to a few new food instagrammers. 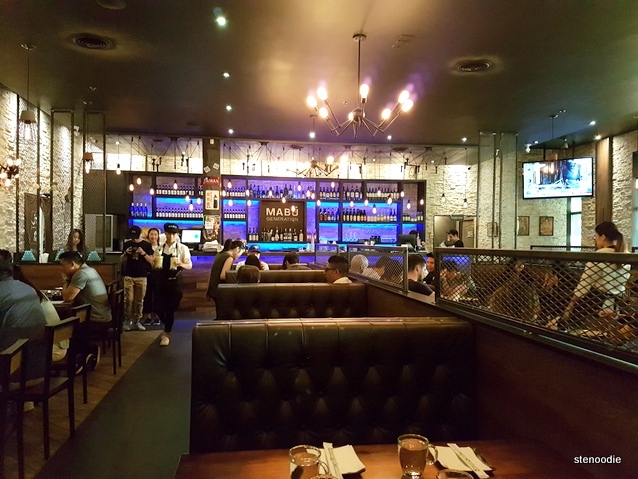 The entire half of the restaurant’s seating was cleared out just for the attendees of DKLoEvents to dine in for the evening. This was very generous of the restaurant. Even more generous was the fact that we were welcome to order anything from the menu that night to try. Yay! This was a great idea. By chance, I sat in a booth with three other food instagrammers, two of whom I had met on previous multiple occasions and one of whom was a first encounter. As a foodie, I always want to try new items from the menu in order to 1) taste the food, 2) get a better idea of the restaurant’s food and quality, 3) be able to promote the food for the restaurant — that was the reason I was here; right? Thus, I wanted to order the items that I hadn’t tried before. Namely, I wanted to order the much-talked about hot pot dish. When I mentioned this, two of the food instagramers at my table commented that they wouldn’t want to order hot pot because it was hot weather outside and hot pot wouldn’t be a good idea. I ignored this because this was my own personal selection of the food I wanted to try. 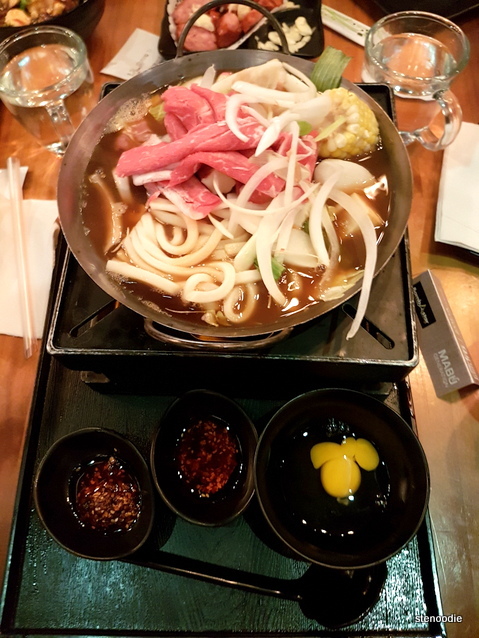 I took guidance from the very friendly and helpful server who recommended the Sukiyaki Hot Pot (Japanese Style Sukiyaki Hot Pot with Udon). I also ordered the House Special Cheese Pork Rib with Rice on Sizzling Hot Plate. Although I had tried the Taiwanese Style Popcorn Chicken here before (I didn’t like it), I wanted to give it another chance to see if it would redeem itself. Unfortunately, it did not. The food instagramer that I had never met before ordered three Taiwanese street food snacks. I asked if she was planning to share these with the table and she said yes. 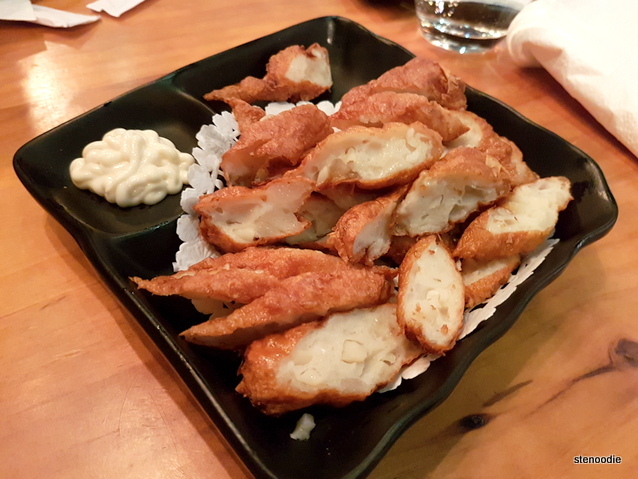 The shareable snacks she chose were the Taiwanese Style BBQ Sausage, Deep Fried Squid Roll, and Grilled Japanese Rice Cake with Condensed Milk & Peanut Powder. The Grilled Sliced Beef & Chicken with House Special BBQ Sauce & Mapo Tofu on Rice was also ordered. First, we actually started off with the drinks. The super helpful server informed us that their new summer items included the Milk Snow Shakes — there were mango, strawberry, and chocolate flavours available to choose from. 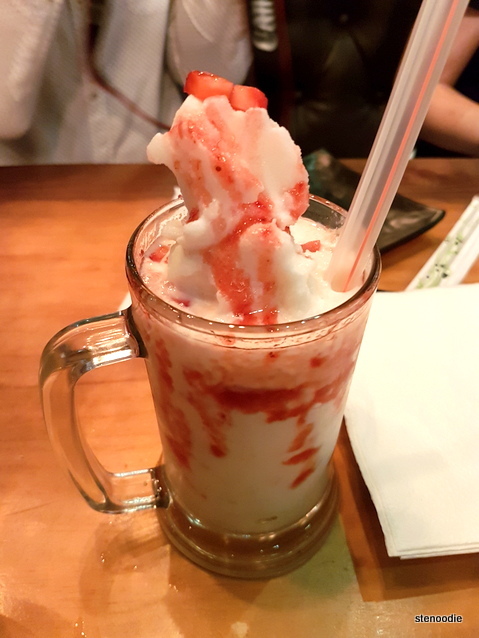 One food instagrammer ordered the Strawberry Milk Snow Shake. I have seen better looking shakes before. 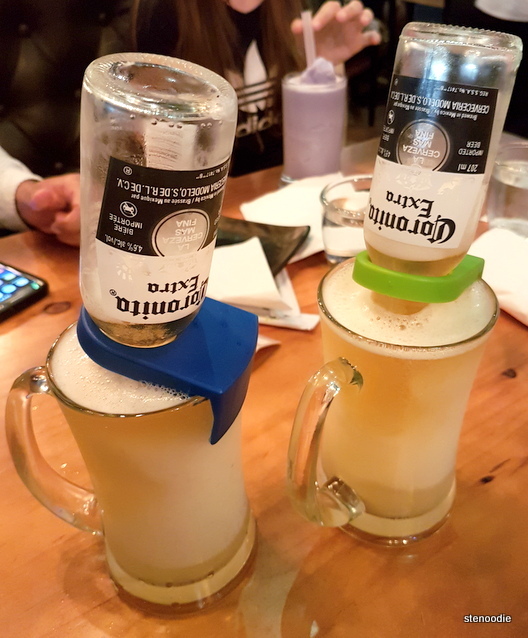 The other drink that the server recommended were the Coronaritas, a popular drink I have seen in Miami, Florida where a bottle of beer is inserted upside down into another drink. I was intrigued by this and tried the White Coronarita. 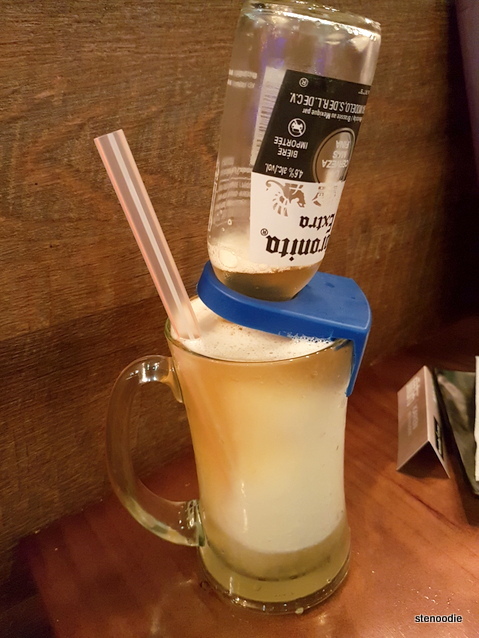 It had tequila, beer, white peach syrup, and white grape syrup. When the White Coronarita arrived to the table, it was definitely in need of a photo op; it looked so cool! (I had had this at State & Main in Alberta too.) Taste-wise, it was refreshing and sweet. It didn’t seem to have a lot of tequila in it though. 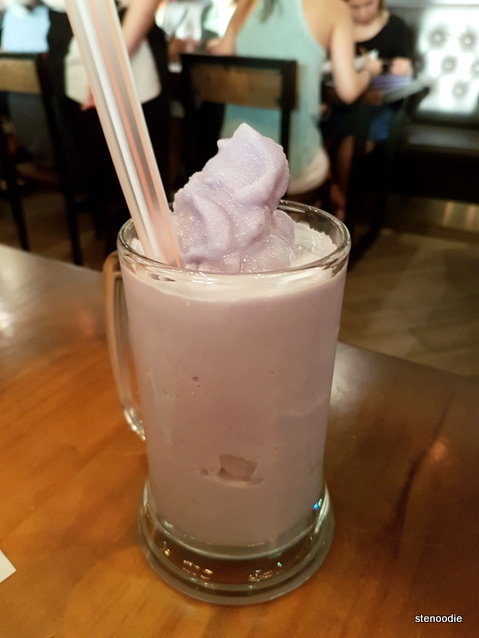 At our table, there were two White Coronaritas, one Strawberry Milk Snow Shake with Fresh Strawberry and Soy Bean Jelly, and one Taro Snow Shake. Before long, the food arrived on our table. There was so much food that we had to keep moving things around in order to fit them all on the table. 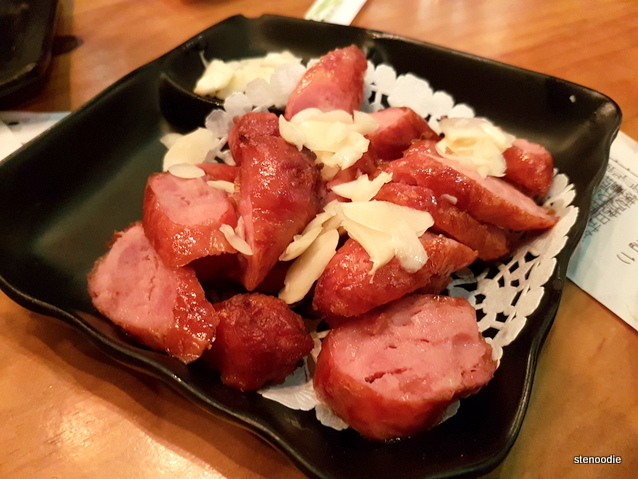 Out of the four snacks that we had, I really liked the Taiwanese Style BBQ Sausage. It was slightly sweet and there were raw garlic slices on top of the sausage too. It was really good! The Deep Fried Squid Roll was decent. 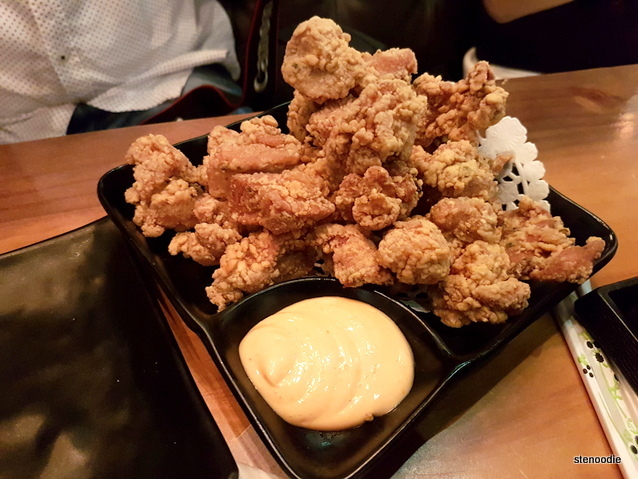 Their Taiwanese Style Popcorn Chicken arrived with a dipping sauce that was spicy. I like my popcorn chicken to be more crispy. The Grilled Japanese Rice Cake with Condensed Milk & Peanut Powder was left on the table for a long time before I actually got around to eating it. This is a dish that is supposed to be eaten hot when the rice cake is still gooey and soft from the heat. Since it was left on the table for a while, it had hardened and thus didn’t taste very good. 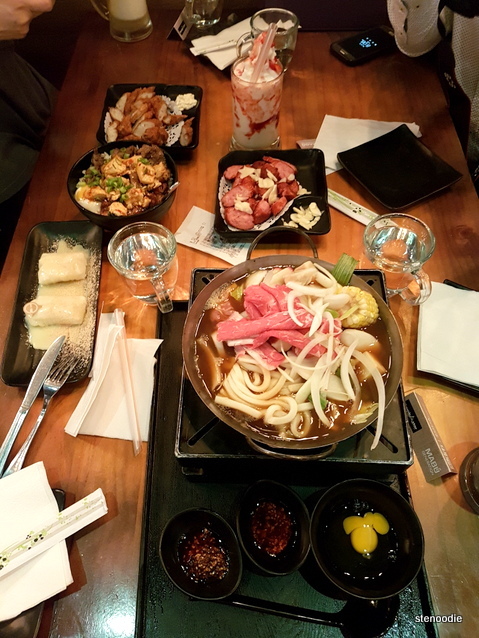 The Japanese Style Sukiyaki Hot Pot with Udon was large and took up the majority of the table space! The sukiyaki soup was very delicious and sweet! It really incorporated the taste of the sliced beef into the broth. It also had pork meatballs, cuttlefish ball, fish tofu, imitation crab stick, kamaboko, rice cake, tofu, onion, sliced white turnip, nappa, enoki mushrooms, cabbage, fresh corn, and mushrooms, and udon as well! It came with three dipping sauces too. It was heated on top of a portable stove — hence the name, ‘hot pot’. 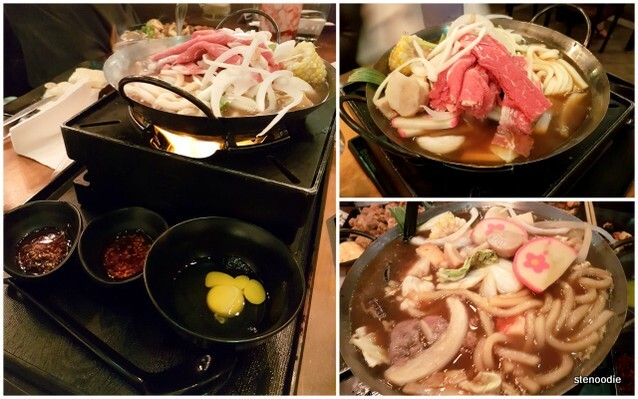 There were so many items in this hot pot that it definitely could have served more than one person. In fact, we didn’t even finish this… more on this later. 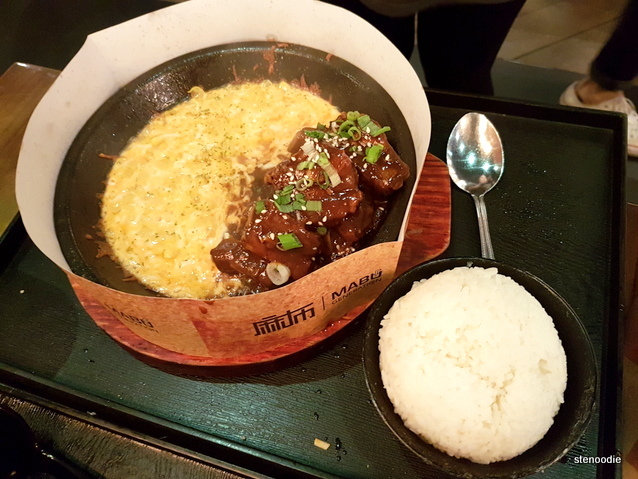 The House Special Cheese Pork Rib with Rice on Sizzling Hot Plate was AMAZING! 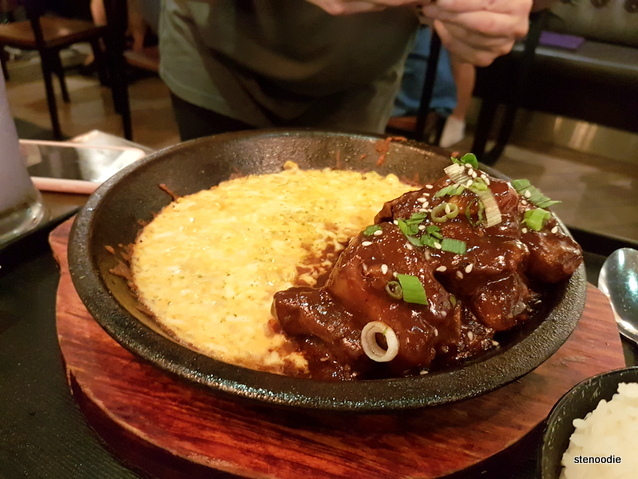 Melted cheese on a sizzling hot plate with pork ribs is a popular dish in South Korea and I really loved this dish. 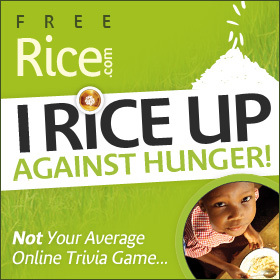 It came with a bowl of rice. The pork ribs were incredibly tender and fell off the bone! I love pork ribs that are like that! It was also seasoned heavily too. The cheese definitely had to be eaten right away off of the sizzling plate when it was still hot and soft. 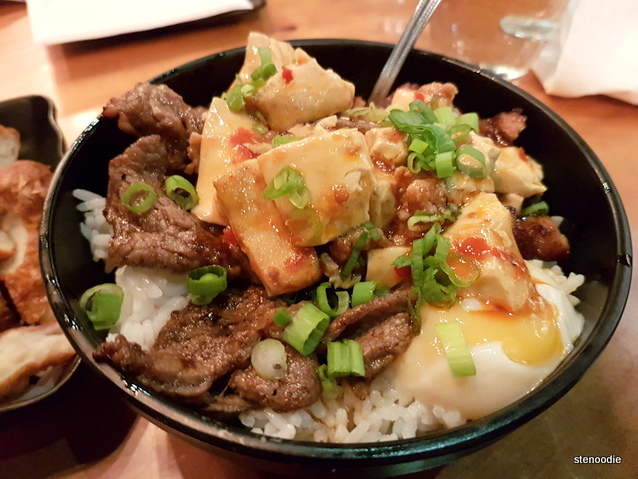 I definitely adored this dish and would recommend it to you if you visit Mabu Generation. The Grilled Sliced Beef & Chicken with House Special BBQ Sauce & Mapo Tofu on Rice was a big hit and I’m so glad that the food instagramers decided to order this. The chicken was full of flavour and had a kick of spice to it too. It went well with the BBQ sauce, smooth mapo tofu, and rice. By this point, all of our savory items had arrived to the table. I found it very curious and odd that I was the only one still eating and trying all the food at the table when no one else at the table was eating. When I mentioned this observation, it turned out that all three of the other food instagramers had eaten dinner before coming to the tasting. Um… I found this really strange. Why would you eat so much food before a tasting that you don’t even have enough stomach space to eat the food that you are invited to try at a restaurant?? I also found it strange that the instagrammer who ordered the three Taiwanese snacks barely touched the dishes. Why would you order it if you don’t even eat it!? Because we had such full portions of each dish left over and I didn’t want the food to go to waste, I suggested that we could pack home the rest into doggy bags. The server was more than happy to provide these for us. When the take-out boxes arrived for us to box up the items, I asked my tablemates again if they wanted to take any food home, they accepted this time. I found it hypocritical that the one instagrammer who rejected the idea of having hot pot meals during hot weather actually decided to take the entire bowl of the leftover hot pot meal home. What. Seriously? I thought you said you didn’t like hot pot during the summer? -_- Also, I thought that it was inconsiderate that all of the toppings for the Grilled Sliced Beef & Chicken with House Special BBQ Sauce & Mapo Tofu on Rice were taken while the plain rice was left at the bottom of the bowl. Who likes a plain bowl of rice with all of the toppings removed?! And of course, the two instagrammers that rejected the idea of bringing popcorn chicken home actually ended up taking those too. Are you kidding me? Once our table was cleared of our items, we ordered the dessert. Since everybody was already so full (I wasn’t), we ordered two desserts to share. One was the infamous honey toast mountain and one was a typical traditional grass jelly dessert. The Mabu Special Grass Jelly came in a really large portion (great deal for this!) and with red bean, sweet peanut, taro, sweet potato, taro Q ball, sweet potato Q ball, sesame Q ball barley, and brown sugar on the side. I love grass jelly in general and this was no exception. However, I thought that the grass jelly could have been more chilled and firm (we chose the cold version). 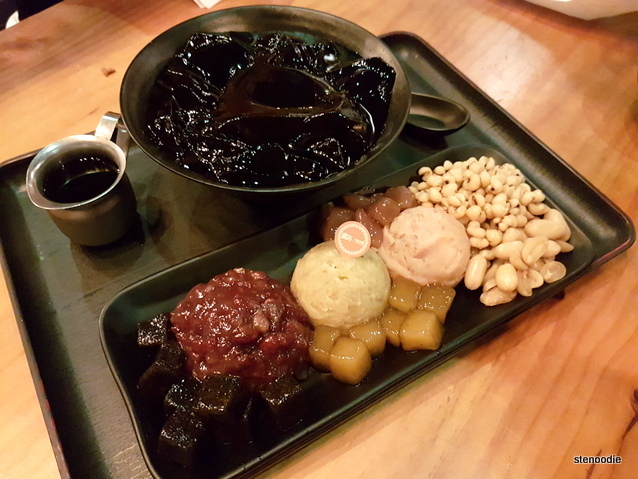 The large number of additional toppings on the side made for a customizable bowl of grass jelly. The ingredients were good quality too. However, I always prefer to have my glass jelly plain and without sugar (to reduce sugar intake). 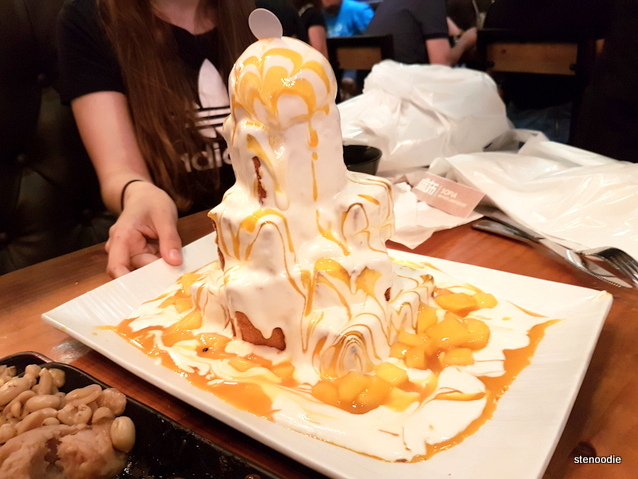 Since this was my third time eating this dessert, I immediately thought that it wasn’t as visually appealing as the other two restaurants’ honey toasts. 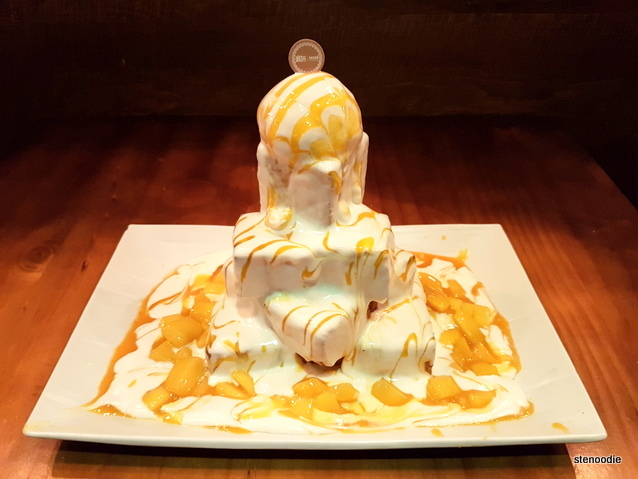 It had the height and was assembled properly but the ice cream and mango sauce swirls looked a little messy and the ice cream started melting very quickly (especially under the bright lights of camera flashes — camera flashes ruin the look of food. 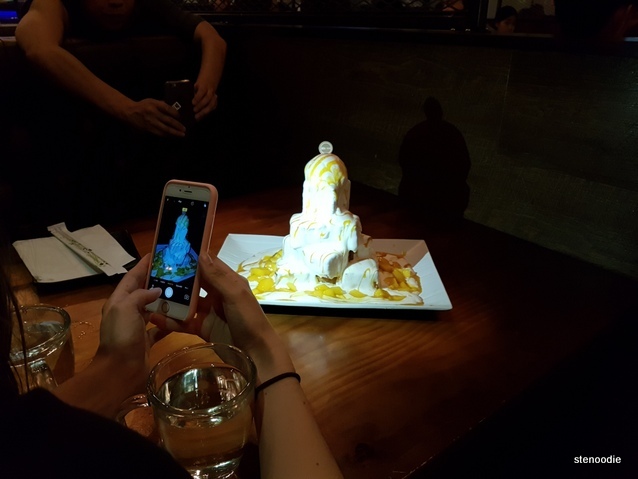 Please for the love of good food, DO NOT use flash when taking food photos[!]. It wipes out all the details of the food and makes the photo appear entirely washed out and unappetizing 😦 ). After the photoshoot was finally done, we tried it. The blocks of toast were put together like jenga pieces so that when you pulled it apart to eat, you have to be careful that the entire thing will tumble down. I didn’t like this Mango Honey Toast. The whipped cream was very dense. The toast was crispy at first cut of the knife but then tasted a little soggy. The best honey toast I have had so far is still at Dazzling Cafe; Petit Potato is a close second. My tablemates each took one bite of the Mango Honey Toast before vacating it. I think they thought that the whipped cream was too dense for their taste. Anyway, the rest of our honey toast was left to waste. By this point, half of my tablemates left the tasting to go home. I tried the Raindrop Cake with Sakura. The first time I had a raindrop cake was at the Night It Up market last year. I remember really enjoying the refreshing taste of “water” in a cake. The Raindrop Cake with Sakura actually didn’t taste like water; it tasted like firm lychee jello. 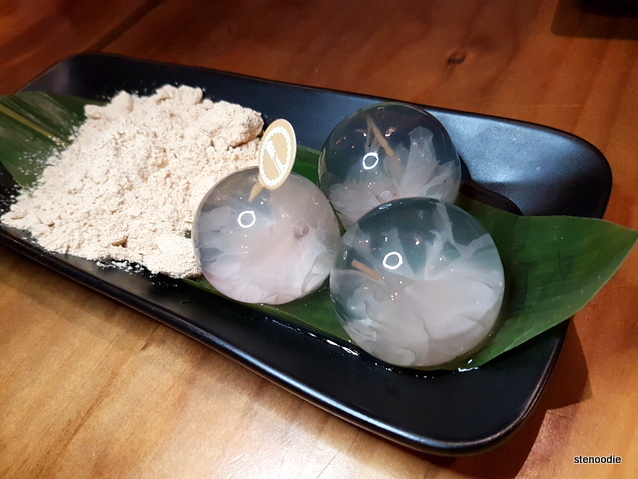 It was basically a lychee jello in a sphere mold. It wasn’t what I expected at all. I liked the original Raindrop Cake I had tried last year better. However, I do have to say that the look of these raindrop cakes was gorgeous! The Japanese Style Soybean Milk Tiramisu was also adorable in looks. However, one bite of this and I wasn’t impressed. It was too dense. 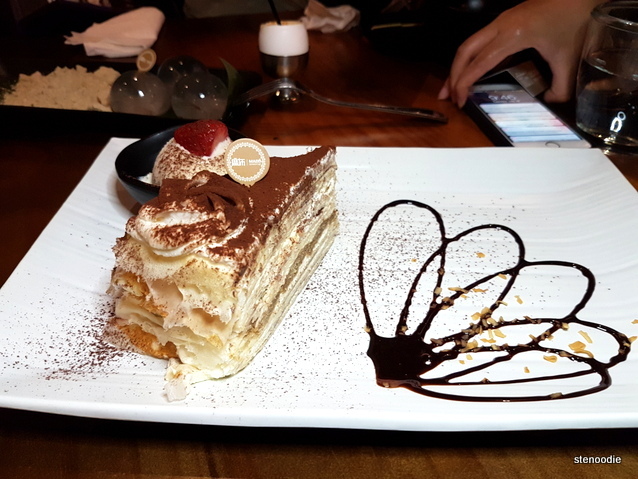 The Tiramisu Mille Crepe Cake was very average. Mille Crepe Cakes must have paper-thin crepes in order to taste fluffy and delicious! This one lacked that. The Durian Molten Cheese Tart had a lot of potential to be amazing. On the plate, it was adorned with fresh fruits and arrived in a set of two tarts. It smelled amazing! Of the quarter piece of the tart that I tasted, the durian taste was present but not too strong. I thought that the tart’s crust was too thick and overtook the taste of the durian entirely. 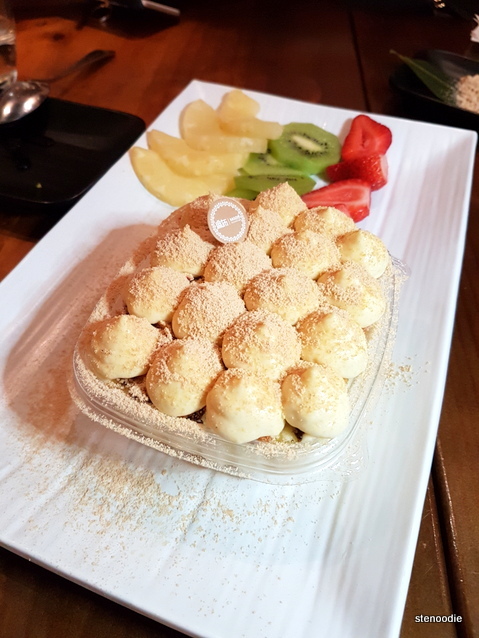 In spite of trying so many desserts with the instagram foodies at the end of the night, there were still a multitude of different desserts that you can choose from at Mabu Generation. 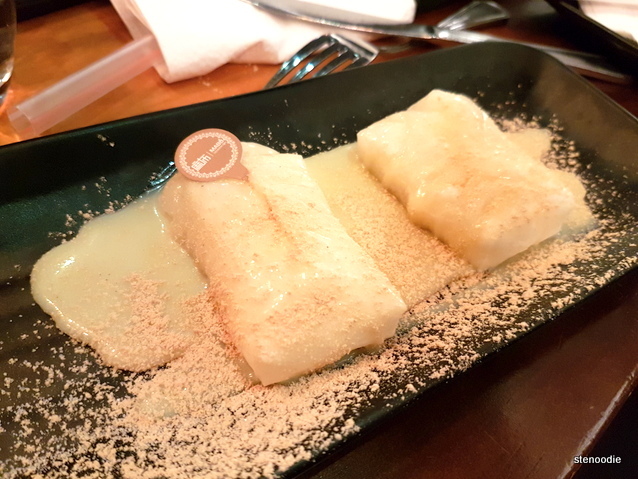 It is quite impressive in fact that they have so many desserts (and savory dishes) in their menu on call to make right away for the customer. Thank you so much, DKLoEvents, for the invitation to this tasting! 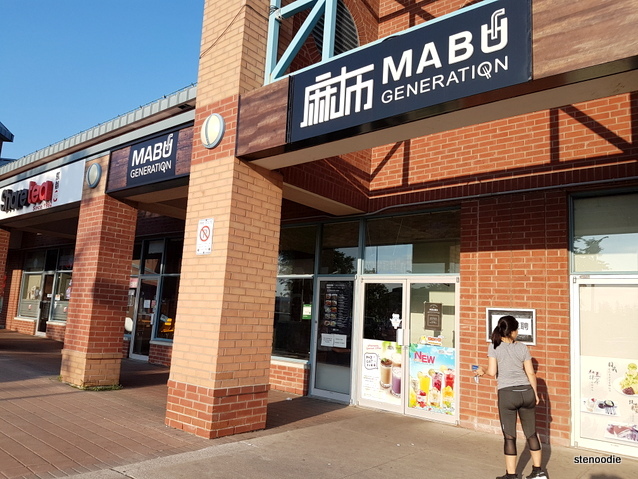 FTC Disclaimer: Although DKLoEvents and Mabu Generation invited me to a complimentary tasting, the opinions expressed here represent my own and not those of the companies. This entry was posted in Complimentary Adventures, Food and tagged 3235 Hwy 7 #23-26, Deep Fried Squid Roll, Durian Molten Cheese Tart, events, First Markham Place, food, food blog, food events, food instagrammers, food instagrammers versus food bloggers, foodie, free events, free food events, Grilled Japanese Rice Cake with Condensed Milk & Peanut Powder, Grilled Sliced Beef & Chicken with House Special BBQ Sauce & Mapo Tofu on Rice, House Special Cheese Pork Rib with Rice on Sizzling Hot Plate, Japanese fusion, Japanese Style Soybean Milk Tiramisu, Japanese Style Sukiyaki Hot Pot with Udon, Mabu Generation, Mabu Special Grass Jelly, Mango Honey Toast with Ice Cream & Fresh Mango, Markham, my honest opinions, Raindrop Cake with Sakura, restaurants at First Markham place, Strawberry Milk Snow Shake, Strawberry Milk Snow Shake with Fresh Strawberry and Soy Bean Jelly, Taiwanese, Taiwanese Style BBQ Sausage, Taiwanese Style Popcorn Chicken, Taro Snow Shake, Tiramisu Mille Crepe Cake, Toronto food blogger, White Coronarita. Bookmark the permalink. One of the main reasons why I constantly come back to your blog is because of the honesty and genuine opinions you publish. It’s more refreshing to see a thoroughly described experience than one that only consists of an item description and emoji. Nowadays, there are a lot of people who snap low-res photos of food and slap on a phony caption, but even more are those that disrespect food and the chef(s)’ efforts overall. Hopefully I’ll be able to exchange opinions over food with you one day! Hi Natalie! That is a very sweet comment and I appreciate you coming back to my blog for my write-ups. 🙂 Hopefully we get to chat over food one day too. I keep observing and get frustrated about some of the things I see at these events sometimes. Good thing it doesn’t always happen but the trend is definitely increasing. I can tell you were clearly annoyed…wow I’m surprised they came after eating dinner when they knew it was a tasting??? ……. thanks for sharing your honest opinions with us, Karen!